You'll love working with 100% Cotton Embroidery Floss Skeins especially at VALUE PACK prices! 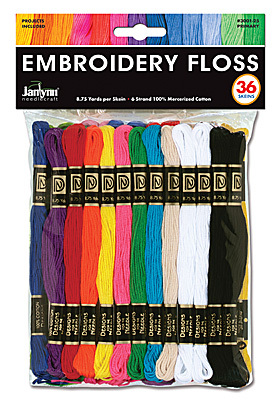 This floss is so versatile in craft and needlework projects. Each package contains 36 skeins of 8.75 yards (8 m) 6-strand 100% Cotton Floss in a variety of 24 Primary colors, White, Black, Cream, Lt Med & Dk Reds, Lt Med & Dk Pinks, Lt & Med Oranges, Med & Dk Yellows, Med & Dk Purples, Lt Med & Dk Greens, Med & Dk Blues, Med & Dk Browns, Aqua and Burgundy.